Film review: Legend - Two Toms for the price of one! Film review: Legend – Two Toms for the price of one! Tom Hardy has, over the last few years, proved himself to be a versatile and committed rising star. The popular Brit’s commanding, if slightly muddled performance in The Dark Knight Rises and his quietly confident work in the breath-taking Mad Max: Fury Road has cemented him as one to watch. However, his most recent foray onto the silver screen, Legend, sees him take on the role of not one, but two iconic British gangsters. But does Tom’s portrayal of both the Kray twins stand up with the very best of his work? 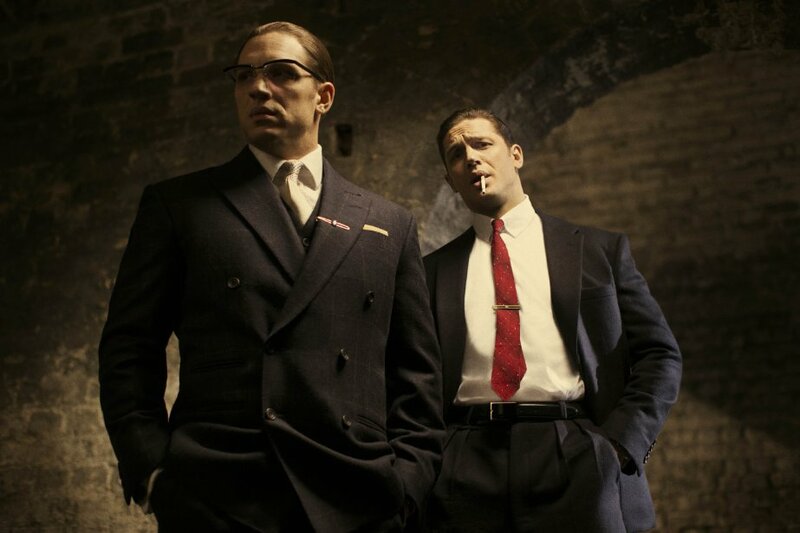 Tom Hardy and Tom Hardy in Legend. Photo by Studio Canal. Director Brian Helgeland takes a very different approach to the film that starred the Kemp brothers in 1990. Instead of focussing on the Krays’ dominance of the London underworld, Helgeland looks into their downfall and what finally ended years of arson and robbery. Emily Browning stars alongside Hardy as Frances Shea, Reggie Kray’s wife, whom he met at the young age of 16. Porcelain-skinned Browning is absolutely stunning in this deeply emotional role and her narration throughout the film is haunting in its simplicity. Of course any cast member starring alongside the much-publicised Tom Hardy will slightly pale in comparison to the actor’s Oscar-worthy performance here. Despite some issues with shot framing and stand-ins where it is blatantly obvious Hardy is not two people, his work is simply magnificent. His ability to create two very different characters is eerily brilliant as Reggie and his schizophrenic, gay brother Ronnie come across as two separate entities. Ronnie provides light comic relief from the onslaught of violence in this 18 certificated film, despite his obvious mental health issues, and Reggie remains likeable throughout, even with his glaring flaws. The plot does get a little muddled over the course of Legend’s two hour run-time and director Brian Helgeland loses his way somewhat in showing the complex and at times horrific relationship between Reggie and Frances. This is a real shame, as his confidence behind the camera during many of the other sequences shines through – a brilliantly choreographed pub fight is the biggest highlight. Soundtrack wise, Legend is a joy to listen to. There are some brilliant 60s tunes here and even those of us who didn’t live in the decade will appreciate the fine choices of music dotted around, perfectly mirroring each of the scenes they appear alongside. Overall, Legend is a confident film that gives a fascinating, if slightly over-dramatic, account of the Kray brothers’ downfall. Emily Browning and the rest of the supporting cast are all excellent with only a flat performance from Christopher Eccleston as a tired detective spoiling the proceedings. However, special mention must go to Tom Hardy who has topped any of his previous work. It’ll be a travesty if he’s not nominated for an Oscar next year.